Thursday 28th June 1917: A case has been heard at the Luton Borough Court in which Edith S. Osborn, a young wife with two infants, claimed maintenance arrears from her husband Walter Henry Osborn. She had married Osborn while he was billeted in Luton at the beginning of the war. He was wounded in action at Ypres and discharged from the army. There were allegations that he had been very cruel to his wife and she was granted a separation order with payment of fifteen shillings a week. Mr. Osborn is now in London, and sent to the Police Court Missionary (Mr. Hawkes) a letter complaining of his poverty-stricken state, saying he did not know when he would get his next pension allowance. He admitted that he received 35 shillings a week, but said he “could not have got about unless a gentleman had given him a pair of trousers” and that his boots were in holes. His wife told the magistrates that her father, who was a naval pensioner was keeping her. The Mayor was reluctant to send her husband to prison and adjourned the case in the hope that Mr. Hawkes would be able to do something for the Mrs. Osborn. Captain Richmond carried out his heroic action during the successful British assault on the city of Baghdad in March. The work was carried out under heavy fire, and the whole attack would probably have been held up without Captain Richmond’s successful feat. The Distinguished Service Order is one of the highest decorations which can be given to a soldier, exceeded in rank only by the Victoria Cross. It is only available to officers – the nearest equivalent for other ranks is the Distinguished Conduct Medal – and it is rarely awarded. 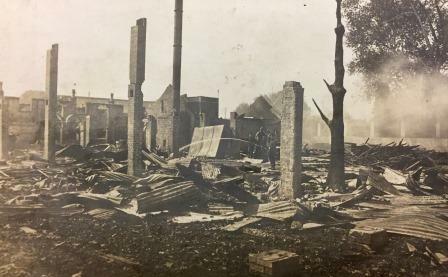 Friday 22nd June 1917: Last night saw the biggest fire Bedford has seen in modern times. It broke out before ten o’clock at Messrs. Hobson and Co.’s timber wharf near the river and devastated about two acres of buildings and wood sheds with their contents. 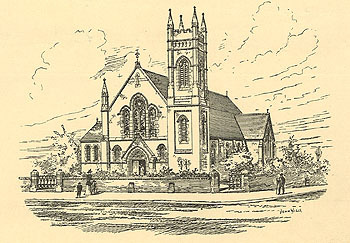 The fire was spotted in its early stages by three young men in the gardens near the Picturedrome. They searched for buckets and water but without success, and the fire soon took hold and the position became hopeless. The Fire Brigade were assisted by their own supernumeraries, the Borough police and special constabulary, and by soldiers in training at Bedford, but the flammable nature of the oils, paints and wood on the premises meant the fire continued to spread. They were also hindered in deploying their hose when it was found that the hydrant opposition the Bridge Hotel had been damaged and was unusable. Fortunately the wind blew the flames across the river and the Brigade were able to prevent it spreading to the south, saving St. Mary’s and Cauldwell Street. However, they were unable to stop the adjacent premises, Messrs Newland and Nash’s malting, from being engulfed by the fire. By midnight the fire had largely burnt itself out and the mill and wood shed had been reduced to a scene of smouldering desolation. WATER SUPPLYIn consequence of the shortage of water at this period of the year, the above Council request householders not to use more than is necessary for domestic purposes, and to avoid any waste by running taps, etc. Standpipes should be turned off immediately after use.Leaking taps should be reported at once to the Water Engineer, and the same will be re-washered free of charge.Water for “domestic purposes” does not include water for gardens, lawns, etc. Water used for the latter purposes must be paid for according to the scale of charges under the Council’s Water Regulations.In every case where water is used for other than domestic purposes notice should be given at the Council Offices, or to the Water Engineer.Penalties are provided under the Waterworks Clauses Acts for waste or misuse of water. WASTE OF WATERNOTICEAttention having been called to the serious waste of water caused by leaking taps and defective fittings on private property, and the unauthorised use of water for garden purposes in the district.Notice is hereby given that proceedings under the Public Health Act (Waterworks Act) will be taken against any person wilfully allowing any waste or leakage or misuse to occur on his or her premises.NOTE. – It is the duty of every tenant immediately to inform his or her landlord or landlady, of any defective pipe, tap, or fitting, and to report same to the Council in writing. The need for these ordinances had become acute. Not only has water wastage by consumers become an issue of national importance, but a considerable amount of water is being lost due to burst service pipes. 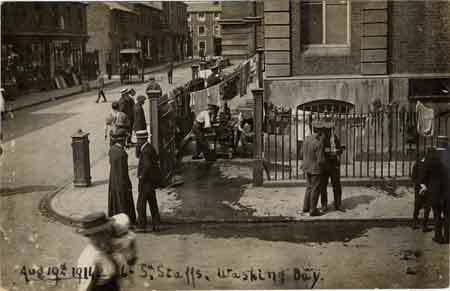 During May the Water Engineer for Leighton Buzzard had to repair to burst pipes in South Street, North Street, St. Andrew’s Street and Market Square. A plan has been draw up of the water distribution system showing where shut-off valves are situated, and five additional valves are to be installed to allow for better control of the system when carrying out repairs. Thursday 13th June 1917: The commandant of the internment camp for German prisoners of war at Woburn has been asked if he would allow some of the prisoners to help with the work of potato spraying; this is now being recommended to allotment holders to help avoid blight. He was rather reluctant as he had in the past taken a great deal of trouble to arrange to provide prisoners as labourers, only to find out that they were not wanted after all. 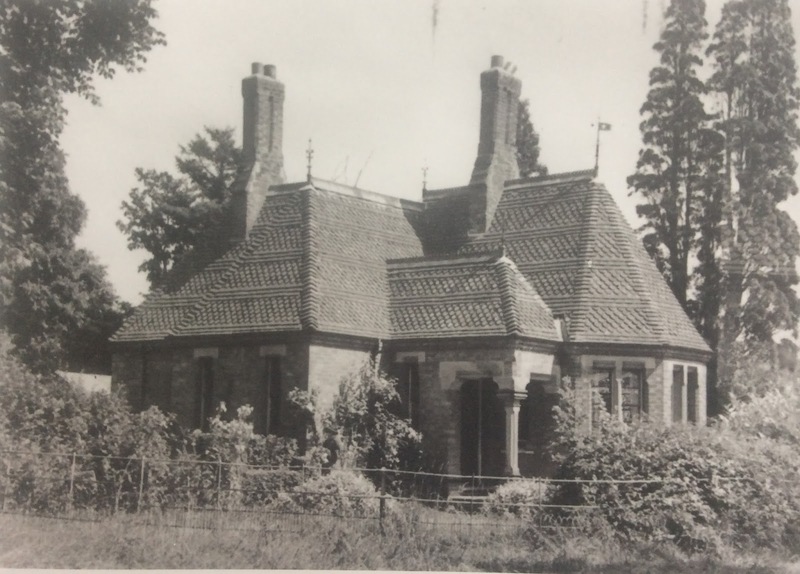 When they were employed in gardening and agricultural work experience showed that the prisoners proved very satisfactory, and he would expect to get permission from the War Office if application was made to him in good time. However, he was now “sick of the labour question” and did not intend to waste time pleading with people to employ the Germans. There was plenty of lumber work available for them. While the German prisoners may make efficient and civil labourers, not all have been prepared to co-operate with their captors. Only a couple of weeks ago one of the prisoners escaped from Woburn Camp and the special constables had to be called out to search for him. He was spotted coming out of Copse Spinney in the parish of Battlesden apparently making for Watling Street, and was recaptured and returned to Woburn by two policemen. Sunday 10th June 1917: The experiences of the village of Sundon give an idea of the impact the war is having on many small communities. From a population of only around 350 people, around 60 have joined the forces. In the area known as ‘Slate Hall’ in Upper Sundon nearly every house has suffered a casualty in the recent fighting. Private Percy Hull and his son Private Percy John Hull enlisted together and have both been wounded. The father was hit in the side and head at the Somme in October last year and has now been discharged from the Army; the son was sounded at Arras on April 24th and is now progressing favourably in hospital. 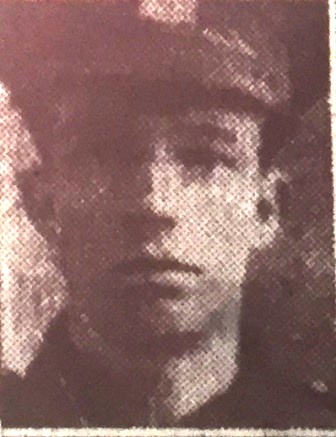 A second son, 19 year old Gunner Fred Hull enlisted last October and is now on his way to the Front. Sergeant Fred Marlow enlisted as a private in the Bedfordshire Regiment in November 1915 and was killed on April 29th, the day after receiving promotion to the rank of sergeant. He was “just going to send a fairy light up for a signal for the artillery to open fire, when a sniper shot him through the head.” Sergeant Marlow’s brother George, who enlisted with the Bedfords in December 1914, has been wounded twice and hospitalised with a skin disease, but has now returned to his regiment. Their uncle, Private C Marlow is a patient in a military hospital in Yorkshire after serving at the Front, and his cousin Private Fred Marlow is in Egypt with the Essex Regiment. No relation to the Hull family mentioned above. 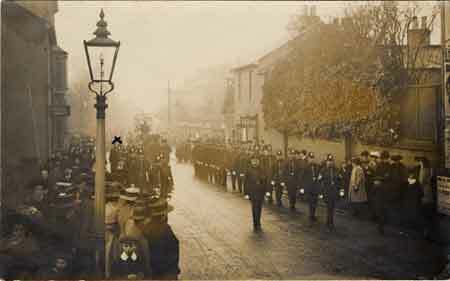 Twenty one men are listed on the Sundon war memorial; most were killed later in 1917 or in 1918. Friday 8th June 1917: Acting-Sergeant Charles Harris, aged 42 and formerly of 8 Water Lane, Leighton Buzzard has been reported missing. Sergeant Harris is a Boer War veteran, who joined the Army at the age of 18. At the beginning of this war he was working at the Wire Works in Leighton Buzzard. Although he was no longer liable to be called up, he volunteered to rejoin the Army and was attached to the Berkshire Regiment. 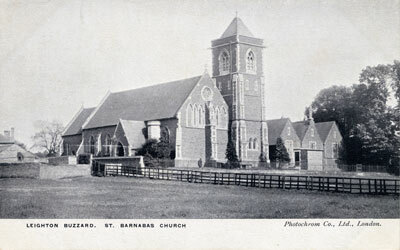 His wife and daughter are now living with her parents at 36, Bassett Road. A Linslade mother is undergoing the same terrible anxiety. Mrs Janes of Soulbury Road is waiting for news of her youngest son, Private Claude Janes of the Oxford and Buckinghamshire Light Infantry. He took part in an unsuccessful attack on 3rd May and was wounded while crawling from one shell hole to another. He has not been seen since and it is hoped that he may have been taken prisoner. Private Janes is just 19 years old and a former choir boy at St. Barnabas Church in Linslade. He has two brothers also serving in the Army, one in France and the other in Salonica. Sadly both Sergeant Harris and Private Janes were killed in action on 3rd May 1917. Both are commemorated on the Arras Memorial. 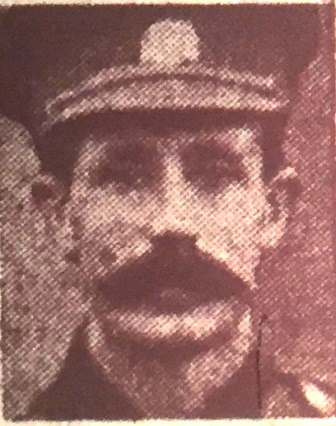 Tuesday 5th June 1917: Two more Luton Borough police officers have volunteered for military service, bringing the total number who have left the Borough Force to serve in the army to fourteen. At the beginning of the War there were 52 police officers in Luton, and the increase in population means that figure should now have risen to 60, but only 36 are now available, including the Chief Constable. The County Divisional Force is also suffering from an acute manpower shortage. It should have a strength of 25 men, but ten have left for the army and two are absent through illness. There are no unmarried men left in either Force. Police Superintendent Panter has paid tribute to the work of the special constables; without their assistance it would be impossible for the police to carry out their work with so few officers. Saturday 2nd June 1917: The Bedford Division Bench is told how a plucky Beatrice Hart chased off a midnight intruder at Clapham Park Lodge. Private Thomas Pyle Porthouse was charged with breaking and entering West Lodge on 27th May. Mrs Hart, whose husband is at war, testified that Porthouse called at her Lodge gate asking for a drink of water. She gave him some water and the soldier then went away, disappearing into the bushes. Before going to bed, she made sure the doors and windows were securely fastened. At 11.30, she heard someone moving around at the back and a window being rattled and forced open. Mrs Hart dressed herself and the children and heard the door from the scullery to the hallway being opened. She shouted: “Clear out, or I will shoot your brains out”. She had an air gun and fired it at the door. 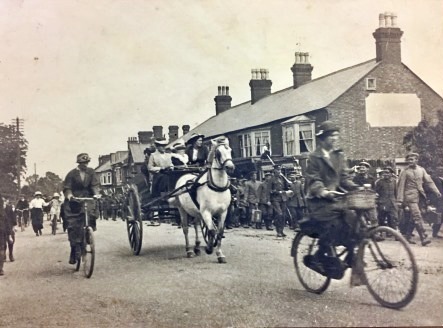 She then sent her boy and girl to the coachman’s house and Mr Plumber came within ten minutes. Together, they examined the house and found nobody there. However, the scullery window had been opened and Mrs Hart’s bicycle light had been taken and used as a lamp on the scullery shelf. The dog kennel had been placed underneath the window. Footprints led to the window from the rose borders, from which the police were able to take a plaster cast and identify Porthouse. That evening, Porthouse had been round for supper at East Lodge with Rose Broughton and had obviously used the opportunity to make an attempt on West Lodge. Porthouse had nothing to say at the Bedford Bench and was committed to the approaching Assizes. Porthouse was also committed to trial for stealing a razor belonging to a fellow soldier, Henry Forrester, whom he was billeted with in Milton Ernest.